Oklahoma is known for its vast cattle ranches and open plains. It is a part of the tornado alley, with some areas having the highest frequency of tornados in the country, and was the first to develop a tornado warning system as well as the first to have a tornado forecast. Oklahoma is responsible for something you use on almost every trip to the store – the shopping cart. There is a large biotechnology industry here, as well as aviation and telecommunications. It is also a larger producer of natural gas and oil. With such a diverse economy, you may be tempted to move here. Our list of the 25 safest cities in the state will help give you a sense of security and peace of mind to know which cities don’t have crime problems. 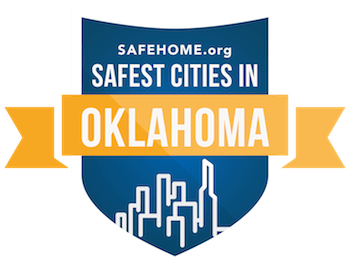 There are three cities in Oklahoma that are among the 500 safest cities in the country. Two thirds of the 25 safest cities in the state have a safety rating above 70. Most of the 25 safest cities have seen a decrease in their property crime rates. Owasso is the safest city in the state with a safety score of 88.3 and a population of 34,814. It is near the major city of Tulsa, providing many job opportunities but away from the higher crime rates that come with any densely populated city. It is in the Green Country part of the state, with lush vegetation and rolling hills by lakes. The median income for families is $76,044. American Airlines is based here, as is Whirlpool, a major manufacturer of bathroom amenities. Tulsa is one of the larger cities with a population of 401,520 and a safety score 57.85. The state capital – Oklahoma City – is the largest city with a population of 630,621 and a safety score of 66.23. Both cities have several suburban cities with high safety scores. You’ll be able to choose freely between the two cities with the most jobs and great safety scores.